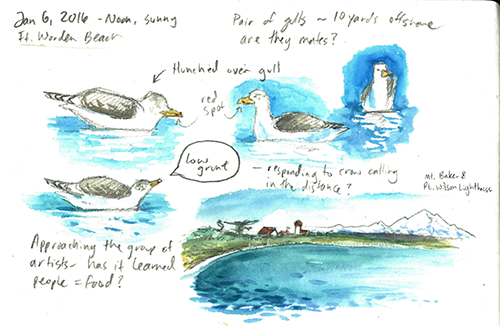 What is nature journaling and why would anyone want to do it? Last week, a group of volunteers at the Marine Science Center got a chance to connect with nature through our Brown Bag Lunch Volunteer Lecture Series on a rare sunny day out on the beach. A nature journal is more than just a sketchbook, and the process of nature journaling goes beyond simply making art that is nice to look at. An important part of the process is making careful observations about what you are drawing, and asking questions about what you see. Nature journaling can be a great way to make deeper connections with the world around you, to become a better observer, and to learn more about plants, animals, geology, or any other natural science subject you're interested in. The best part, of course, is that it's lots of fun! You get to decide what approach to take, and what you want to get out of it. Visit our blog to read the rest of Carolyn's story!